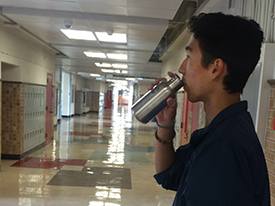 [Press Release] As classes start this week, 700 students entering Berkeley High are going to school with free, stainless steel, reusable water bottles. Made by the Chico-based company Klean Kanteen, the water bottles were distributed at freshman orientation by Youth Scholars from the Ecology Center’s Youth Environmental Academy. This water bottle giveaway was funded by the Berkeley Sugar-Sweetened Beverage Tax, which voters passed in late 2014. The water bottle giveaway is the first of many Measure D-funded activities aimed at increasing awareness of the health risks of sugar-sweetened beverages and promoting water consumption among Berkeley youth, particularly those from low-income families, the demographic most vulnerable to health problems caused by sugar-sweetened beverages. In his marketing webinar entitled “Winning the Hearts and Minds of the Global Millennial Generation,” Joe Tripodi, Chief Marketing and Commercial Officer for Coca-Cola, said, “Vision 2020 is Coke’s plan to double its business by 2020… This aggressive plan is focused on dramatically increasing consumption of sugary beverages by young people using precision marketing that targets young people, mostly in Latino and African-American communities in the United States…” Berkeley’s City Council, under advisement by the City of Berkeley’s Sugar-Sweetened Beverage Product Panel of Experts, is using Measure D tax revenue to fund programs aimed at reducing the consumption of sugar-sweetened beverages in Berkeley and addressing the health effects of such consumption. Berkeley’s soda tax was the subject of a peer-reviewed study that UC Berkeley researchers released last week. The study, which included a survey of residents of low-income Berkeley neighborhoods, reports a 21% decrease in consumption of sugary beverages, and a 63% increase in drinking water, compared to before the soda tax went into effect. “Not only was the drop in sugary drink consumption in Berkeley greater than we expected, the apparent shift to less harmful products like water is a very good sign,” said Kristine Madsen, the study’s senior author. National news media picked up the study, as an indication of Berkeley’s soda tax efficacy. Election campaigns are underway in neighboring Oakland, San Francisco, and Albany for voters to enact similar measures. This entry was posted in Blog, Ecology Center in the News, Featured and tagged Berkeley High, For Thirst Water First, Measure D, soda tax, water, youth development, Youth Environmental Academy by Ecology Center. Bookmark the permalink. This sounds awesome. I would love to know more about how to bring this to my school.